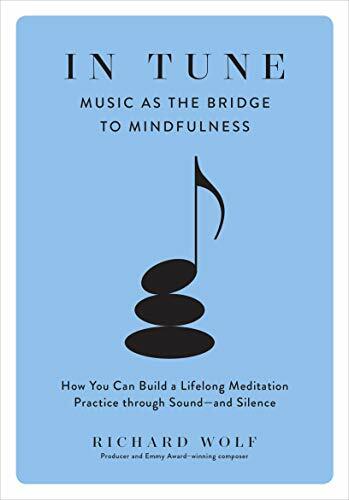 Richard Wolf’s new book In Tune: Music as the Bridge to Mindfulness blends together the patience and dedication of music with the concentration required for deep meditation. In his Prelude, Wolf explains the concept of his book with, “In music the intuitive aspect of consciousness is tapped, nurtured, and encouraged; the same is true in contemplative practice.” And with these words he begins to weave the two concepts together. He introduces what he deems the twelve bridges as mentioned in the title, and within each chapter he clearly defines these bridges. Each chapter is clear in its content and the relationship between music and meditation. Readers who may not be musically inclined yet still have an artistic streak such as writing or visual arts may still find the information explained here beneficial. His discussion on Posture explains the body’s relationship with the instrument being played and the importance of posture and concentration. Here he emphasizes the requirement to “Find a time during your day that is most conducive to practicing.” Again, the web is being cast drawing music and meditation close together. Wolf’s discussion about Harmony is especially interesting as he brings in dissonance: “dissonance . . . can also be beautiful. We need to make room for disharmony to coexist with harmony.” He talks about the importance of jarring our lives as it gives negative thoughts an opportunity to be recognized and dealt with. It should be noted that throughout the book, Wolf places importance upon breathing and the role this activity plays in meditation. While breathing is a natural activity, something we don’t think about, we just do it—in order for meditation to work, an awareness of breathing is most important. Each chapter moving forward—Practice; Deep Listening; Patience and Perseverance; Mindfulness and Creativity; Trance, Music, and Meditation; Sympathetic Vibrations; Transcending the Self; and Silence—brings its own importance to the relationship between music and meditation, while at the same time continuing to build the bridges that transcend the exercises and create a sense of self-awareness. Wolf ends the book with what he terms “Bonus Tracks: More Modes of Mindfulness Training.” These are more complex in musical activities and include Tonal Breath Meditations (there is the breathing again); Trichord Meditation; Pythagorian Intervals; Strumming the Mind-Body Guitar, which again involves controlled breathing; and ending with a brief discussion on Coda: A Still Small Voice. These bonus tracks are not for the faint of heart, and those who do not have a deep working understanding of music may find these tracks difficult to put into motion relative to meditation. The techniques, key steps, and commentary that Wolf provides in each chapter as he blends music and meditation together will prove beneficial to the reader who wants to cross these bridges for a more meaningful mindfulness. In Tune is an intriguing look into meditation, and Wolf does a good job of clarifying how music and meditation can work together.